My name is Kristian Lund-Jensen, I was born in Esbjerg in 1985. I lived in Billund until 2010 - after which I moved to Thisted in North Jutland. Now i have moved to Bramming, just outside Esbjerg in South Jutland. I was educated as a sheet metal worker in 2010, but am currently studying to become a technical designer, for Cimbria A/S. I finished my first knife in 2001, but I have only made knives on a regular basis since 2009. 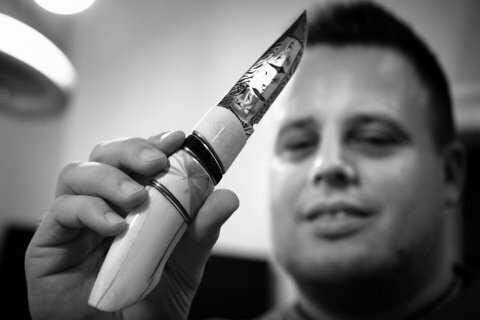 I have as knifemaker chosen to make Nordic inspired knives composed of natural materials such as antlers, horns, mammoth, hippopotamus, walrus and wood in combination with pewter, silver or other metals. I also manufacture knife sheaths, they are made of compressed leather - which will be decorated. My hobbies are - besides the knife building - hunting with rifle and shotgun, finding fossils, history and amateur archeology.